Ultra-Fab Deluxe Landing Gear eliminates old fashion cranking, at an affordable price lift, level and stabilize your 5th wheel at the flip of a switch! Having a 5th wheel requires a lot of lifting and leveling. You need to be lifting to get the Kingpin perfectly matched up to the hitch and leveling when you need some stability like an even living room, because yours is slanted. The Ultra Fab deluxe 5th wheel landing gear does it all! You can easily flip a switch to lower your kingpin to your hitch, and stabilize or level your RV. The Ultra-Fab Deluxe Electric 5th Wheel Landing Gear is perfect for any 5th wheel, especially larger models or those with heavy or front weighted slide-outs. Is the ground an inch or two uneven on one side of your campsite? You only need to raise up one side of the trailer? No problem! Each leg on the Ultra-Fab Deluxe Landing Gear has a control switch, giving you the command over both of the legs, or one leg at a time, whatever you need! With a 21” stroke and adjustable extensions you can raise this landing gear set up to 38”, for the steepest of inclines. With the built in slip clutch you don’t have to worry about over extending and ruining the gears. Once you get to the maximum height allowed you cannot go any higher. Note**It is not recommended you use landing gear to lift your RV for repairs like changing a tire. Two powerful 12 volt motors can lift and lower your RV for stability and hitch attachment, up to 12,000 lbs! You can have the heaviest of trailers and the Ultra-Fab landing gear is up to the challenge. The extra wide foot pads are built in to prevent sinking, giving you a sturdy support for your landing gear. Easy installation, you put the control box wherever is easiest for you and at the flip of a switch you can level, lift, and stabilize your 5th wheel. No more hand cranking! The Ultra-Fab Deluxe Landing Gear is perfect for the RVer who wants an electric jack landing gear at an affordable price, from a company that offers a three year warranty! 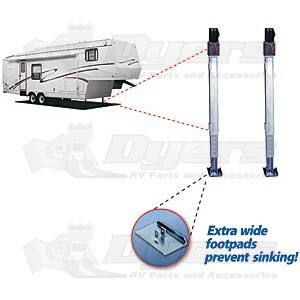 Check out Dyers for all of your jack, landing gear and RV part needs. We have a great selection of parts and accessories because we are RVers too! Area of Foot Pad – 22 sq. in. Power Requirement – 12 Volts D.C.
Two powerful 12 volt motors eliminate hand-cranking. Lifts and levels your 5th wheel at the flip of a switch. Built in slip clutch to prevent damage from over extension. Allows for independent positioning of foot pads, especially on uneven surfaces. I decided to install the gear myself and it took a couple of days getting the old ones off, but the new ones were a breeze to put on. I was pleasantly surprised when I got them installed and discovered that the heavier landing gear took about 90% of the sway out of my camper. Now I can walk around the camper with practically no movement. The dual switches makes leveling the camper a pleasant task; because, I no longer put leveling blocks down, pull up then back up to add or remove to try to get it level. I simply lower one side and raise the other and in a few seconds it's level. Fast shipping, fairly easy to install if you have a welder, work good so far. Found myself stuck in a new campground across the country from home when the old Keystone-stock lifts failed. Was leaving the unit for several weeks so shopped quickly and ordered the heaviest duty units I could find online. The free shipping didn't hurt. They arrived and were installed by an RV tech I've still to meet. By all accounts everything went well and the lifts perform fine. They will get a workout by me over the next few months. Based on reviews they should do well. I'm withholding judgement on the separate switches - do people really use lifts this way to level side-to-side? Seems wrong to me. Anyway, really wish the supplied switch had a feature to run both lifts from one switch....will probably retrofit that later. So far all is good. If this changes I WILL be back to report on it. Sleep better knowing I have something under my 5th Wheel to keep it UP! You don't know how important landing gear is until you don"t have any. We were 3 hours from home when our single motor gear went south. Made a day trip for a tripod to help support the hitch while using a hydrolic jack to help lift our 2006 Keystone Laredo. The same manufacturer of the tripod stabelizer also made landing gear twice as powerful as what we had. Got home and read some of the other reviews, and ordered the Ultra Fab gear from Dryer (best price around). Had to remove 1/4" of the top part of the bottom support bracket to get one of the jacks to fit. Wish Keystone would have put this product in to begin with. The cost was only about $150 more from what was factory installed. The new gear dosn't have manual operation with out removing the motors, But the old side hole for the previous manual hand crank worked great for mounting the new switches (used existing hole for feeding the wires.